Information collection, reporting and research are produced with support from the federal Sport Fish Restoration program. Heart of the Hills Fisheries Science Center is located on Highway 27 in Kerr County, Texas, approximately two miles south of the town of Mountain Home. The facility receives water from Stockman's Springs (also called Ellebracht Springs). Water temperatures range from 60º to 75ºF year-round, which allows investigations of both cold-water and warm-water fishes. The property covers 55.8 acres and includes 25 research ponds, laboratories, offices, and storage buildings. The center is open from 8 am to 5 pm Monday through Friday. Tours can be arranged by calling or writing in advance. HOH Fisheries Science Center has its roots buried deep in the past with the origin of Stockman's Springs. These life-giving waters once supplied the Indians of the Archaic period (400-3,000 years ago) and possibly provided for Cabeza de Vaca and his men as they passed through the area in 1534. Later the springs offered respite to weary travelers on the Chihuahua Road from Mexico to Indianola. 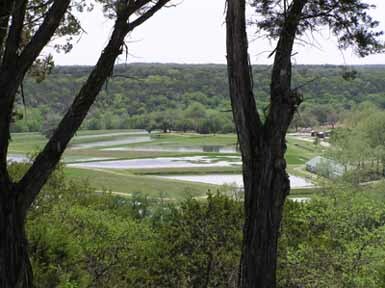 In 1925, the State of Texas obtained water rights to Stockman's Springs and, thanks to the donation of 36.4 acres of land by C.R. and Maud Eddins, opened Heart of the Hills Fish Hatchery. In 1929, 19.4 additional acres were purchased from the Schreiner family, and in 1935, the Works Project Administration built the present-day concrete canal system. The facility remained a fish hatchery for more than four decades. In 1969, with the support of the Federal Aid in Sport Fish Restoration Act, the HOH Fisheries Science Center was established. A research staff was formed and in 1970, the main office building was completed.